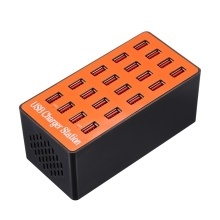 It is designed for a great solution for multi USB-chargeable devices charging at the same time, solving the confusion of lacking of USB-outlets for factory, hotel, hospital, school, pub, shopping mall, travel, office and family safe multiple digital devices charging simultaneously. 20-port charging ports intelligently identified current which provide strong efficient power supply without additional converter. LED indicator features the charging status, crystal clear and convenient for real-time monitoring. Extended 20 USB ports solve a ultra fast non-interference multi device charging solution, time-saving and space-efficient. Cooling louver, radiating aluminium sheet and built-in ultra-silent cooling fan greatly reduce device&apos;s temperature. Hypothermia and energy-efficient. Compact size, easy to carry, worldwide universal, ideal companion for public places, such as factory, hotel, hospital, school, pub, shopping mall, travel and family use. Please confirm the plug type when you make the order, if you are not sure which plug you want, you could contact with us, we&apos;ll help to choose, thank you!